Here begins a series of interviews and dialogues with al-Maqālāt who describes himself as “an independent media outlet”. He tweets under @Al_Maqal_Ps. The reader will find that the interviewees attitudes and views are useful because he encapsulates a certain outlook which serves as a useful barometer for how some Salafi-Jihadists view the world. Note for instance the nuanced relationship the author has with ISIS. In this way then, Al-Maqālāt makes what seems incomprehensible to the Western reader, comprehensible even if it is wholly unacceptable to his or her world view. The interviewees usefulness has not gone unnoticed. As such his writings have appeared on prominent blogs such as the influential blogs Pietervanostaeyen.com and Jihadology.net. With this in mind, this blog has decided to field questions that are in the public interest, in the hope that it will shed light on current trends on Jihadism. Whilst the questions are mine, the answers below are his views and his views alone. The title of this post in fact was chosen by al-Maqālāt himself. Q1. Can you tell me more about the influence of Abu Qatadah and similar Salafi Jihadi theorists especially in Europe? Q2: David Thomson [a French Journalist] has attributed the rise of Jihadism to the internet. He says that there is a disjunct between old Jihadists and new Jihadists. Is this true? Q3: How do young people view Jihad, what inspires them and who are their intellectual masters? 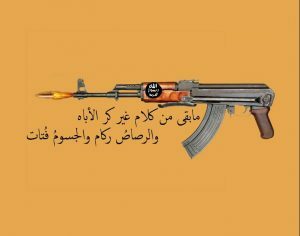 Jihadi propaganda with lines of poetry harking back to the past. “We live a period characterized as a defensive Jihad. Such a Jihad does actually not need too much theoretical and theological deliberation from the Muslim Ummah [the community of believers ed.]. If somebody enters your home and tries to harm your beloved ones you will not stand still, think and theorize about the matter. Rather you will react instinctively and defend your relatives or family. This is our basic human nature, whether you are Muslim or not. So it is important that we return to this basic principal before we delve into Jihadist theorizing, because much of this talk about Jihadism tends to distract from the root cause and the obvious human nature behind the escalating cycle of violence we are witnessing today. The influence of Jihadi theorists is therefore blown out of proportion if you ask me. The Jihadi theorists only articulate, outline, guide and detail what the Muslim Ummah already knows and feels in its heart and mind. 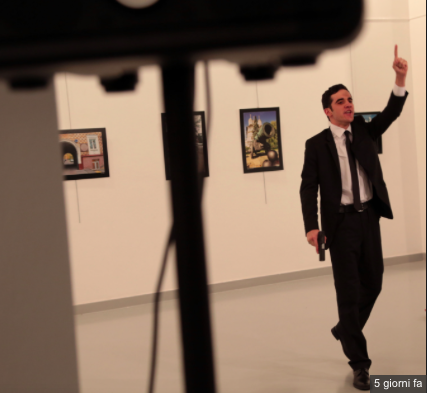 When Mevlut Mert Altintas killed the Russian ambassador Andrey Karlov in Ankara many analysts and terrorism experts were guessing in the dark about the Jihadi affiliation of the perpetrator while they ignored the human nature of the narrative. The assassination of Andrey Karlov was no surprise at all, it would have been equally expected if the embassy of Myanmar was attacked in Jakarta for example. Turkey is a Muslim country, meaning its overall citizens are Muslims, and it is a neighboring country of Syria, again a Muslim country. So the real affiliation is staring us right in the eyes. Muslims all over the world are hurt by what is happening in Aleppo. No one asks any questions or looks for explanations when millions of Muslims collect clothes and humanitarian aid for the Syrians of Aleppo, but when Muslims decide to take revenge for the Syrians of Aleppo we are startled and surprised, looking for explanations. While the influence of the Jihadi theorists is overrated, the human reaction of the Muslim Ummah is very much underrated. Politicians, analysts and experts did not learn anything from the Arab Spring, so it seems. Did the Jihadi theorists mobilize the Muslim masses in the Arabic Spring, or did the Muslims themselves realize that the tyrant puppet regimes who oppress(ed) them needed to be deposed? When the Muslims went out on the street during the Arab Spring did they really obey the incitements of Shaykh Usama bin Laden who has been calling for a popular mobilization against the tyrant regimes for decades? No, the people acted on their own human impulse, not on the articulation of this impulse. Shaykh Usama bin Laden did not only call for these protests, he even predicted them. Looking at our situation this mobilization was an expected natural reaction from the Muslim Ummah, or any other nation for that matter if they were in a similar situation. There are many deviant and misleading scholars who support- and try to cover the crimes of the tyrant puppet regimes, yet they have had very little effect on the human nature of Muslims during the Arabic Spring, even though the Muslim masses acknowledge that they are less knowledgeable in theological issues than these scholars. So if Muslims are really driven by external influences like Jihadi theorists and scholars, then why are they not influenced by these deviant scholars who clearly outnumber the Jihadist theorists? Deviant scholars have large stages with a far reach at their disposal set up the tyrants, yet they have very little effect on Muslims. If the Ummah would have listened to these deviant scholars, propped up by the tyrants, there would not be any uprising against the tyrants, there would not be any Jihaad in Syria, Yemen, Afghanistan, Libya, Mali, etc. The tyrants would easily and peacefully oppress us. However Islam is revealed in harmony with our human nature. If we are massacred and our countries are occupied then our natural instinct will not tolerate this, let alone our religious zeal and honor. Immediately after the assassination of the Russian ambassador in Ankara the Council of Senior Scholars in Saudi Arabia condemned it. Rather they did not only forbid this attack, they even claimed that is was forbidden for Muslims to be happy about it. Their reach is in the hundreds of millions, however the Muslims will not feel less happy about his death after this hypocritical verdict which does not only go against our religion, but it even goes against our basic human nature. Thus the rise of Jihadism can not be attributed to the internet. If the internet did not exist the Muslims would mobilize the same way, as our human nature and religion will not accept oppression. We did not accept it when the Moguls attacked us, we did not accept it when the Crusaders attacked us, and so forth. It is the tyrant oppression and massacres in our Muslim countries which gave rise to Jihadism. The rise of Jihadism is probably traceable to the Afghan-Soviet Jihad in the seventies. Furthermore, we have our own platforms. Many analysts said that the Arab Spring was organized through social media, but it was actually the mosques which organized the demonstrations. After every Friday prayer the Muslims would go out on the streets. And there have been many popular uprisings before the internet like the uprising of Hama in 1982 in Syria. The same goes for Jihad, many fronts were opened before the internet, like the failed Algerian Jihad in 1990 following a coup by the Army. The greatest Jihadi theorists lived and compiled their work before the internet. The different Jihadi fronts from recent history are strongly connected, as these various fronts hatched theorists and Mujahid leaders who are still relevant until this very day. Rather they are more relevant than contemporary theorists. I would also not say that the internet gave birth to a generational divide. The Jihadist realm experienced an evolution, or in some cases devolution, even before the internet. Furthermore, such divisions existed centuries ago in the Islamic history. These divisions are often caused by decay of knowledge and faith, if we were to look at the deviant and extremist sect of ISIS for example. Similar to the original Khawarij sect, this generation even opposed the senior companions of the Prophet (SalAllahu Alayhi wa Selam) dozens of centuries ago. Furthermore, the intellectual and theological level of Muslims in general is very deficient, in comparison with Muslim generations from history, despite the massive information overflow on the internet. So the internet does not seem to have increased the awareness, including Jihadism, and the intellectual evolution of the Ummah, on the contrary. This is actually predicted in by the Prophet (SalAllahu Alayhi wa Salam), as writing will increase while knowledge will decrease in The End of Times. It is understandable why the enemies of the Ummah ignore the root causes of so-called Islamic terrorism. They try to explain our armed struggle with all kinds of theories about radicalization, because if they would acknowledge the root cause of the armed struggle they label terrorism, then this would force them to address it and deal with it. The Western people would force their governments to reconsider their capitalist and oppressive foreign policies in our countries for example. So again it is understandable why politicians and the like ignore the root causes for this cycle of violence. However it is not understandable how analysts and terrorism experts fail to recognize these causes. We must also understand, for argument’s sake, that there is a difference between a Mujahid and a Jihadi, just like there is a difference between a Muslim and an Islamist. These analysts and experts only seem to talk about the Jihadi and the Islamist, but nobody really talks about the Mujahid and the Muslim. Mevlut Mert Altintas was a Mujahid, not a Jihadi. Many Muslims on various fronts on the world are Mujahideen, not Jihadis. Furthermore, the Mujahideen actually outnumber the Jihadis. The Muslim Ummah is going through the transition of an exclusive elitist Jihaad to a popular peoples Jihad. The so-called Lone Wolf terrorist does not have to be a radical Jihadist or an Islamist, he does not have to be influenced by Jihadi theorists or Mujahid leaders. No, the images of massacred innocent Muslim civilians and the desperate cries for help, which nobody can ignore, are enough to activate the general and average Muslims. Some will be activated to provide humanitarian aid and the like, others will be activated to take revenge. However many analysts and experts still seem to be stuck in the sixties. Many Muslims unfortunately, especially the youth, are likewise stuck in this view on Jihad. Some act like hooligans, cheering for their own club. We are beyond this outdated view on Jihad. The enemies unite while they divide us into easy swallowable pieces. Even the so-called supporters of the Syrian opposition (Turkey and the US) have united with the enemies of the Syrian opposition (Russia and Iran), while we do not hasten to unite. When talking about Al-Qaedah for example we must understand that they will dissolve into the Ummah like we have seen in Syria. This was their strategy from the get-go, and this is the only way they will really outlast their enemies. The same goes for all other groups and factions, they will gradually dissolve into one Muslim force, starting from local alliances and merges, to global networks and organizational structures, until we become one army. Our hearts are united, we feel pain if our brothers feel pain, we are happy if our brothers are happy. This is why so much foreign fighters have traveled to Syria, even from countries that are already at war with the enemies of the Ummah like Chechnya indeed or Turkmenistan bordering Afghanistan. And this is also why our martyred brother Mevlut Mert Altintas avenged the Muslims in Aleppo. This practical unification needs to increase in addition to the emotional unification. Our hearts and bodies, both, need to be one. This is where the Jihadi theorists and Mujahid leaders play a supportive role. After the Arab Spring the first thing Shaykh Usama bin Laden advised was setting up advisory councils, think tanks and research centers who will coordinate and guide the revolutions in different parts of the Muslim world and spread correct understandings and awareness. The enemies of the Ummah form one body through different unions, unifications and alliances. If one of them is attacked then the other allies rush to its support, they support each other militarily, economically and politically. This resembles the Islamic model of brotherhood which we as a Muslim Ummah unfortunately neglect. We must understand that this is not only an important religious teaching, it is an important strategic teaching as well. That is why the enemies of the Ummah are using this concept of unity, alliance and cooperation, a concept which would suit the Muslim Ummah much more. So the classical Jihadi scholars and leaders are trying to re-shape this concept in the Ummah. Many Muslims agree with it instinctively, without reading the works of Jihadi theorists. Many Muslims already share each others pain and sorrow. However these instinctive emotions shared by many Muslims need to be shaped into practical applications, so that Muslim brotherhood can be revived in the Ummah on an effective and meaningful level. The borders that divide us will consequently be rendered useless if our battles unite. The Jihadi theorists aim to expand the local and isolated nature of our shared struggle. Not only must the different factions in Syria unite and work together inside of Syria, all the other Mujahid groups on different fronts over the world must unite and work together as well. In that case the Mujahideen in Yemen or Libya for example could attack Russian or Iranian targets in their countries, or execute other similar operations, to avenge and support the Muslims in Syria. Not only must the Mujahideen unite and coordinate, but we as an Ummah in general likewise need to unite and support each other. It is a shame that Zionist Jews who occupy Palestine and massacre Palestinian Muslims can roam freely as tourists in Sharm Al-Sheikh while they sunbathe at the Gulf of Aqaba and the Red Sea. The same goes for the Americans who bomb our countries in Afghanistan and Iraq while they enjoy the sun and food in our countries as tourists. Would the US allow al-Qaedah to go on a city trip in New York? There is of course very little benefit in attacking Western tourists in our countries like Shaykh Abu Muhammad al-Maqdisi explained, but this scenario shows how dire the situation is in our Ummah. While the Muslims in Gaza are suffering, their Muslims neighbors in Egypt stand by and watch, in addition to the tyrant Sisi regime which closes the suffocating border crossing of Rafah. We must show our local and global enemies that we are one organized and coordinated Muslim body. Such unity on a local level would change the Jihaad in Syria and the situation of the Ummah on a global level tremendously. When Aleppo was attacked by the regime in full force we saw very little activity on other fronts in Syria to elevate the pressure on Aleppo. Because the factions did not coordinate effectively, they did form a strong supportive unity. Look at how much time and energy factions wasted on the Operation Euphrates Shield, an operation of secondary importance, while Aleppo was being destroyed by the regime. With all the attention of the regime, Iran and Russia being focused on Aleppo, other fronts in Syria could have benefited from this distraction. ISIS was actually the only one who finally grabbed this opportunity by seizing Palmyra. Unfortunately however, it is impossible to cooperate and unite with ISIS, they have closed this door completely. You can only be a Mujahid if you pledge your allegiance to Abu Bakr Al-Baghdadi, only the soldiers or supporters of ISIS are considered to be Mujahideen. That is why we saw some extremists from ISIS label Mevlut Mert Altintas as an apostate. If he pledged his allegiance to Al-Baghdadi they would have considered him to be a Mujahid and a martyr. They will not praise any Mujahid who operates outside their fictional Caliphate. But even if their Caliphate would be authentic, then even the Prophet Muhammad (SalAllahu Alayhi wa Selam) praised the operations of Abu Baseer Thaqafi who did not operate under the direct command of the Prophetic Islamic State in Medinah. This is the same attitude of Al-Qaedah and other Mujahid groups, or Muslims in general. They praise any Mujahid operation that is done to support the Muslim Ummah, even if they differ with the methodology of the group or the Mujahid behind this operation. Look at how many Muslims have supported Jabhat Nusra previously while they do not agree with the methodology or strategy of Al-Qaedah. Next Next post: Fathi Warfali: A Democrat who Sought Martyrdom in the Fields of Afghanistan.